Christmas is just a few days away but you’ve still got time to scoop up a few great gift items for the tech savvy traveller in your life. (He or she is probably on a plane or train anyways!) Now you could just get him or her an iPad, but they probably already have one, and if not, I would definitely hold out for the iPad 2. One of the coolest gadgets we’ve seen this fall is the Swiss Army Knife known as the Victorinox Swiss Army Flash Laser 4GB. In addition to scissors, a knife, a nail file, a screwdriver, a pen and a flash drive, it has a laser! Just make sure to take the flash drive out of the casing before boarding the plane, or tuck this into your check bag. Buy it here. As an established international brand of luxury and business travel, Tumi offers quality that is hard to beat (although their prices can be steep). If you’re taking your laptop on the road and want to avoid the thumb clenching feeling from using a track pad all day, Tumi’s mini Travel Mouse ($75) is your new best friend. 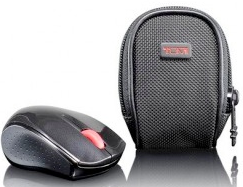 It operates via a wireless nano receiver which tucks into the mouse for easy storage. Grab a AAA battery and insert the receiver’s USB plug into your laptop and you’re good to go. Buy here. The LifeStudio Plus drive provides ultimate flexibility for a connected traveler with an integrated 4GB USB flash key that allows users to quickly sync important files and folders for use on multiple devices. Face it, we all have those files that we just can’t live without, no matter where we are. The LifeStudio external will let you take them with you without breaking the bank. It’s probably the last external you’ll grab for years. Buy it here. 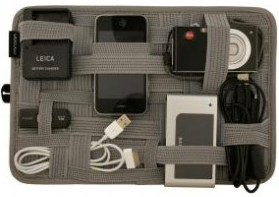 This a woven catchall of elastic bands is made specifically to hold objects like cameras, MP3 players, chargers and cords firmly in place. It’s slim and fits conveniently into a laptop bag or travel case and features a rear zippered pocket for additional storage. Buy it here. USB chargers have never, ever looked this cute. 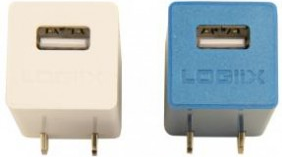 The Logiix USB Power Cubes come in three colors and feature a plug design that folds up when you arent using it to power up your iPod, iPhone, camera or any USB device. We love gadgets. If we didn’t, then we wouldn’t recommend the Grid-It system. But honestly, who needs to carry around more than one USB charger? Get this one, stick it in a bag and get going. Buy it here. 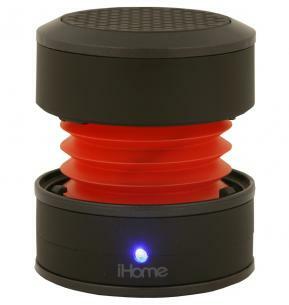 iHome’s iHM60 Capsule speaker is a small, travel friendly speaker that extends accordion style for your iPod, iPhone, laptop or any MP3 player through the headphone jack. It features a built-in lithium ion rechargeable battery, vacuum bass expansion, USB charging, and comes with a protective carrying case. Fun, right? Buy it here. Finishing off with a classic. Owning these is a right of passage in any connected traveller’s life. They are undoubtedly the best noise cancellation headphone you can get. They’re extremely comfortable and deliver a bright, encompassing sound. The headphones come with an annoyingly bulky carrying case, AAA battery and an airplane adapter. Buy them here.